Suzuki Motor Corporation is a Japanese multinational corporation headquartered in Minami-Ku, Hamamatsu that manufactures automobiles, four-wheel drive vehicles, motorcycles, all-terrain vehicles (ATVs), outboard marine engines, wheelchairs and a variety of other small internal combustion engines. The worldwide sales volume of the automobile is the world's tenth largest, while domestic sales volume is the third largest in the country. Suzuki motorcycle India recently launched a stylish ‘Special Edition’ variant of its flagship scooter, the Access 125, in New Delhi. The special edition scooter will only be available in the white colour scheme. The front of the Suzuki Access 125 gets a new fascia and headlamp, while the side profile gets curvy body panels to match its retro character. The scooter now comes revamped with a more appealing design and is loaded with a bunch of new features. This comes with a powerful engine, comfortable seats, and a stable ride. The Access 125 features chrome finished highlights, aerodynamic body contours, chrome-finished multi-reflector headlamps, and a 3D emblem logo. The subtle touches of chrome on the headlamp and the exhaust shield give it a premium feel. The Access 125 comes with a new Suzuki Easy Start System and a DC power socket. The Suzuki Access 125 gets more angular lines while the handlebar mounted large headlamp with chrome housing and apron mounted turn indicators give the new scooter a dominating face. The shutter key has a one push central lock system. The horizontal exhaust looks weird but the chrome heat shield will be appreciated by most Indian buyers. Powering the Suzuki Access 125 is a 125cc single-cylinder engine which delivers 8.6bhp and 10.2Nm of torque, through a CVT transmission. This engine comes armed with the company's proprietary Suzuki Eco Performance (SEP) technology, which improves the efficiency without compromising on the performance. the engine is capable of yielding a claimed mileage of 64kmpl and a top speed of 91kmph. Ground clearance of the scoter 160mm is helpful in tackling bad roads and the ground clearance is decent and will get you through most rough patches. The fuel efficiency hovers around the 43kmpl mark which is notes impressive as the competition, but what will impress the rider is the rapid progress that the Access makes. The new scooter comes with six colour options to choose from which include: Candy Sonoma Red, Metallic Mat Fibroin Gray, Pearl Suzuki Deep Blue, Glass Sparkle Black, Pearl Mirage White and Metallic Sonic Silver. Suzuki Access 125 is the best selling gearless scooters in India. Suzuki's Access 125 is a decent effort by the company with a powerful engine, comfortable seats and a stable ride which is enjoyed by the rider. The stability and smoothness of the engine is fantastic at speeds above 60kmph. the Access is powered by a 125cc single-cylinder engine that produces 8.5bhp and the CVT helps in the smooth delivery of power preferable by the young riders also. 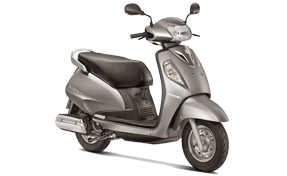 Suzuki Access 125 prices start at Rs. 50,706 (Ex-Showroom) and the top end variant Suzuki Access 125 Special Edition Disc is priced at Rs. 61,575 (Ex-Showroom). Suzuki Access 125 is available in 4 variants and 9 colours.